I believe in Minecraft Auburn, and love it. I don’t know what Minecraft is. I mean, I’ve heard of it, I know it’s a thing that’s out there. But I had to Google it. What’s important is that there is dude or dudette uploading videos to Youtube who knows what Minecraft is—they were obviously born to Minecraft—and who also knows what Auburn is. And when you combine that knowledge, well… remember when you’d get home from middle school and see those commercials for ITT Tech or Herzing Institute or whatever, and imagined how awesome it’d be if there was a job of tomorrow out there that would let you design some sort of Sim City: Auburn 3D with an option to light the inside of Samford Hall with torches? 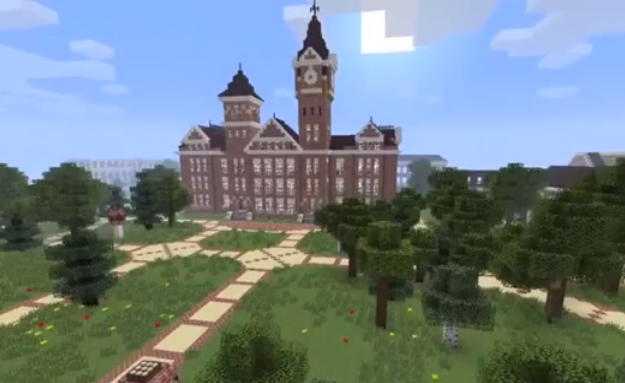 “This is a Minecraft project to build the entire campus of Auburn University in a 1:1 scale model,” writes Weagler Minecraft in the “About” page for the below Minecraft masterpiece, which was uploaded last Friday. Yep, you read right: The entire campus, all 1,843 acres and 89 academic buildings worth. Weagler has ten of those buildings rendered so far (with “measurements taken from Google Earth to represent accurate placement”): Samford Hall (with aforementioned torches and clock tower chimes! ), Langdon Hall, the Langdon Annex, Hargis Hall, Biggin Hall, Charles E. Davis Aerospace Engineering Hall, Ross Hall, Mary Martin Hall, Cater Hall, and the RBD Library. You can also see a Minecrafted Toomer’s Corner complete with Minecrafted Toomer’s Oaks. I believe in Minecraft Auburn, and love it..
Related: Auburn man makes LEGO model of Samford Hall.